BILIGIRI RANGANATHA TEMPLE BILIGIRI RANGANATHA TEMPLE - Shiva Maha Purana, Vishnu Purana, garuda purana, bhavishya purana, skanda purana. 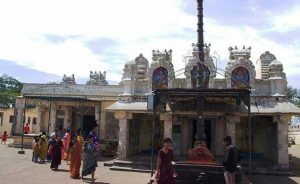 The Biligiri Rangan Hills, popularly called as the B.R.Hills in short, are situated near Mysore of Karnataka, and the place has an ancient temple dedicated to Ranganatha. ‘Biligiri’ in Kannada means ‘white hill’ and from the plains the hill range looks greyish, enveloped by white clouds. Surrounded by thick forests on all sides, the peak of the hill reaches about 1332 metres above sea level. The temple and the small hamlets on top and the approach ghat road through the forests present breathtaking views. Herds of elephants roam freely and a visitor is likely to come across a herd on his way more often than not. They can be even seen moving about in the dense greenery below as though in a silent movie. Also found are other animals like deer, sambar, bison, peacock, etc. Srirangapattana, he was pleased and made magnificent grants to the temple. Thus, Srinivasa, thereafter, came to be called as Ranganatha and the entire range of hills as the Biligiri Rangan Hills. The temple is a medium sized Dravidian structure of great antiquity. Although the enclosure is quite big, there are no beautiful sculptures or artistic additions worthy of mention. The ‘Mulavar’ and ‘Uthsava’ idols are however, very charming. The deity is said to have been installed by the sage Vasishta. The Lord carries a sword in addition to the Shanka and the Chakra. The Kannada saint Kanakadasa is said to have visited this place and sung the glory of the Lord. There is a cave on the hills called the ‘Kanakadasa cave’ where he is supposed to have stayed. There is a separate shrine for the Goddess with a Tamil name Alamelumangai Thayar. Idols of some of the Alwars are also found in the temple in separate shrines, which confirms that in the past, the place must have been a centre of Tamil Vaishnavites. The Soligas, a type of local forest tribals, live on these hills. They take great care in the maintenance of the temple and also play an important role during the various festivities and rituals at the temple. They assert that Lord Ranganatha had a Soliga tribal consort in the olden days. This reminds us of ‘Thuluka Nachiar’ of Ranganatha of Sriramgam temple in Tamilnadu. Two important festivals are celebrated annually with great pomp. One is the annual car festival (Rathothsava) which takes place in the month of Vaishakha. The chariot is pulled by devotees, who gather in thousands at that time. Innumerable fruits and flowers are offered to the deity at ‘that time. The other festival is the Kalyana Uthsavam. This is a celebration of the marriage of the deity. There is an interesting interlude towards the end of the festival. After the celebrations, the Lord and his consort will be seated opposite to each other in the ‘mandapam’. It is said that the Goddess is a ‘Padithanda Pathni’, which means ‘one who never crosses the threshold’. The priest representing the Lord will request the Thayar to go out with him in the procession. At that moment, some one in the crowd will release a rabbit to dart across in between the two deities. Then the Goddess will indicate that since the rabbit has crossed her path, it does not augur well for her to go out. The Lord only goes out in procession to give ‘darshan’ to the devotees. Every year, huge leather ‘chappals’ are prepared and offered to the Lord to enable him to wander in the forest and protect the people around. Special mention must be made of the Champak tree which is said to be more than 700 years old. This ancient’ tree is situated below the ghats away from the temple and pilgrims worship it as the black stones found around the tree are said to be ‘Salagrama’ stones. Viswa Shanti Ashram started by an educated Sadhu from Kerala is also a popular place near the temple. Dr. Sudarshan, is in charge of the Vivekananda Girijana Kalyana Kendra, which is a voluntary organisation devoted to the welfare of the forest tribals. The hills are being rapidly developed as a tourist spot and modern amentities reach through government agencies. There is an experimental station for serculture and potato research. Coffee and cinchona plantations are coming up. The hills are definitely worth visiting as they offer grand scenic beauty with a glimpse of wild life as an additional attraction. The peace and quiet in the temple on top will prove to be a rewarding experience. B.R.Hills can be reached directly from Bangalore or Mysore as the place is connected by a regular bus service through an excellent road. The distance from Bangalore is about 250 kms., and about 120 kms, from Mysore. There is a motorable road up to the top of the hills. Visitors can stay at the Government rest house or the Dharmashala of the temple.